Have we seen that shot of Guts before...? We have. It was a color page included with one of the episodes a while back. If I'm not mistaken, it was during the tentacle fight on the Sea Horse. I don't remember the specific episode, though. Yeah, we've seen that one before. Unfortunately I can't remember where it came from though. It was the cover of an extra book that came with Young Animal a while ago. Thanks! 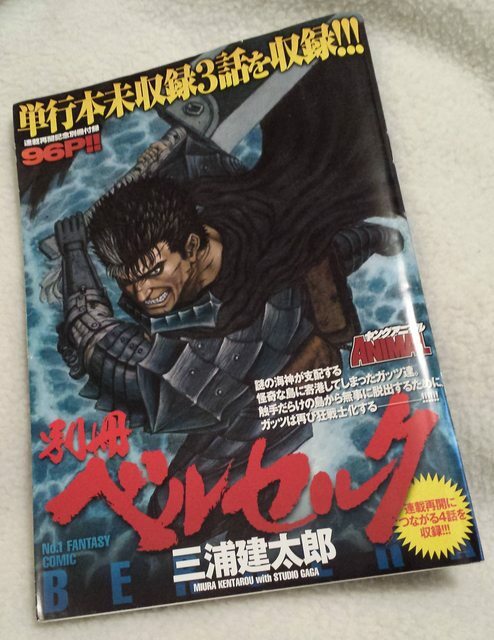 Just one more reason we really need Miura to organize additional art books... There's so much uncollected material at this point, it's crazy. You guys should do a like button for posts like this! But I agree with Walter, we need a new artbook! We can still wish it right? Took a pic of the ad for next issue. Nothing new, but now I can actually read the preview text. Paraphrase: Rickert has arrived at Falconia. What will he find there?! 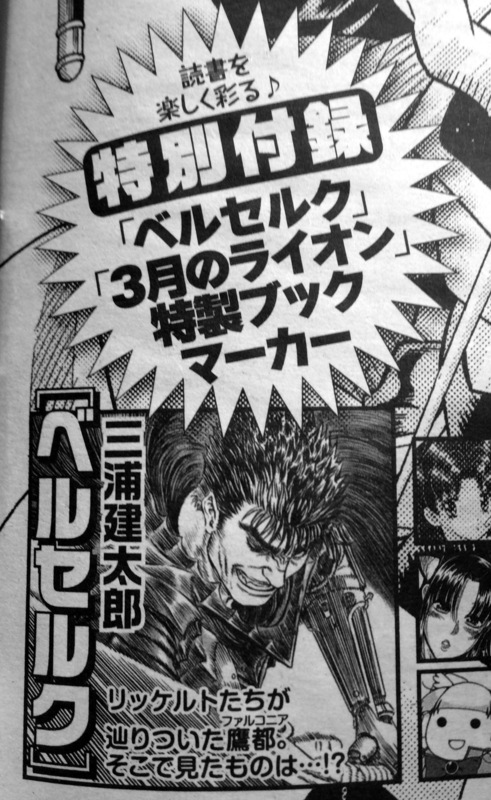 It also announces a Berserk/March Lion bookmark coming in that issue. Wonder what art it will have? Hopefully something new. What indeed?! Thanx Walter. Can't wait to see Rickert's face once inside Falconia. This is gonna be priceless, with him being one of my favorite side characters. Let's hope he becomes a main character, I could certainly see him taking over for Griffith and the Bank of the Hawk's perspective now that Falconia is a reality. Rickert is easily one of my top favorites, I'm more interested in his and Erica's development than I am everyone outside of the obvious Guts/Casca. Which is weird because I normally loathe children in my stories. I also hope we see more of Laban and Owen. My hunch is Rickert will continue on with them, though I wouldn't mind him running into Sonia or Mule as well. It seems to fit. I'd also like to see Minister Foss. I almost feel nostalgic, like we're going to maybe get a piece of those Golden Age politics again, except this time Griffith is king. And now that you mention it, I'd really like him to meet Mule and Sonia. It'd be an interesting meeting imo. while the citizens are seeing Griffith as their saviour etc. Do you know any sites where i can order the next issue of young animal ? I could certainly see him taking over for Griffith and the Bank of the Hawk's perspective now that Falconia is a reality. I don't think the others necessarily need to be removed in terms of perspective. Adding Rickert to the mix certainly provides an interesting context the others don't have, since he knows about the true nature of apostles (and fulfilling a possibility we've been talking about here for almost 3 years). But that doesn't mean Raban, Owen and Foss, or any other characters that rear their heads in Falconia, also wouldn't be valuable. Which is weird because I normally loathe children in my stories. That's... a weird thing to say. I also hope we see more of Laban and Owen. My hunch is Rickert will continue on with them, though I wouldn't mind him running into Sonia or Mule as well. It seems to fit. I'd also like to see Minister Foss. I get it. Basically, you'd also like to see the rest of the cast. I almost feel nostalgic, like we're going to maybe get a piece of those Golden Age politics again, except this time Griffith is king. Could be, but it wouldn't make a lot of sense to have the same kind of court intrigue, given the complete control Griffith must be exerting--blessed by the people as a hero, the princess as a lover, and the pontiff as a savior. He's essentially eliminated political strife. A better question is are there those in Falconia who who don't fall in line (and what are there reasons for not doing so?). It would definitely be neat to see if a downtrodden element of society exists within Falconia. I imagine it will be. Yep. Regardless of his reservations, pretty sure it's going to come down to ensuring Erica's safety. I subscribe to it through Kinokuniya books in New York. If you're local to New York City, you can visit there yourself and pick up the latest magazine. Otherwise, a 6-month subscription costs about $180, shipped--and that's the minimum order that they'll fulfill. If you're interested in setting that up, call here (415) 673-7431 and tell them you'd like to subscribe to Young Animal, a magazine published by Hakusensha. And if you want the next issue, I'd call today and let them know you'd like that subscription to start immediately. The last episode had 21 pages. The three episodes before that had 24 pages each. Could be, but it wouldn't make a lot of sense to have the same kind of court intrigue, given the complete control Griffith must be exerting--blessed by the people as a hero, the princess as a lover, and the pontiff as a savior. He's essentially eliminated political strife. Beyond that, he has a supernatural grasp over the city that is pretty much insubvertible. It reminds me of Locus' words in episode 291: "This kind of trifle affairs that goes on in this world, it is meaningless already." I have to thanck you Walter, but i am living in Austria, so it shouldn't work for me unfortunately. I'm so excited I can't even put it into words! There is a Kinokuniya in Oregon where I live, I'm going to have to find out if they stock YA there. Subscribing is out of my budget so buying issue to issue is my only option right now. That's the best option if the store's close to you anyway. That way you only get the issues with Berserk! I wish I could do that here in montreal, but I don't know any shop that could get them. Damn it! There's a place somewhat nearby (half hour drive) where I can buy YA, but sometimes when I would drive out to get a copy I cant tell if the issue has sold out or they have simply not arrived to the store yet. Im definitely going to check out the store 3 times next week if I have to. If they definitely receive the magazine you could probably just reserve a copy that way it'll be waiting for you when you arrive. One episode this friday but after next episode will be in Young Animal #11 (23/05). I'm guessing a last Falconia episode this week, then a cut to Elfhelm. Makes sense for maximum teasing. Interesting that he seemingly didn't stockpile the episodes. I'm optimistically hoping he's setting a new pace by skipping 2 issues after coming back from a long break. A narrative break would be consistent, historically. You mean like a release every month? or more like 1 every 2 months? i would not mind either option. less stress for the master imo then a release every 2 weeks. Either way, soon it's gonna be Berserk time with an awesome episode. yeah I thought it could go that direction at some point. Makes sense as you say. Very intresting hopes in this topic, nice share.